The Future of the Latin America Fly-In students meet with Eliot Pedrosa ’95, U.S. Alternate Executive Director to the Inter-American Development Bank, and Guillermo Areas ’92, governmental relations for Latin America at the BMW Group. – at the Inter-American Development Bank. 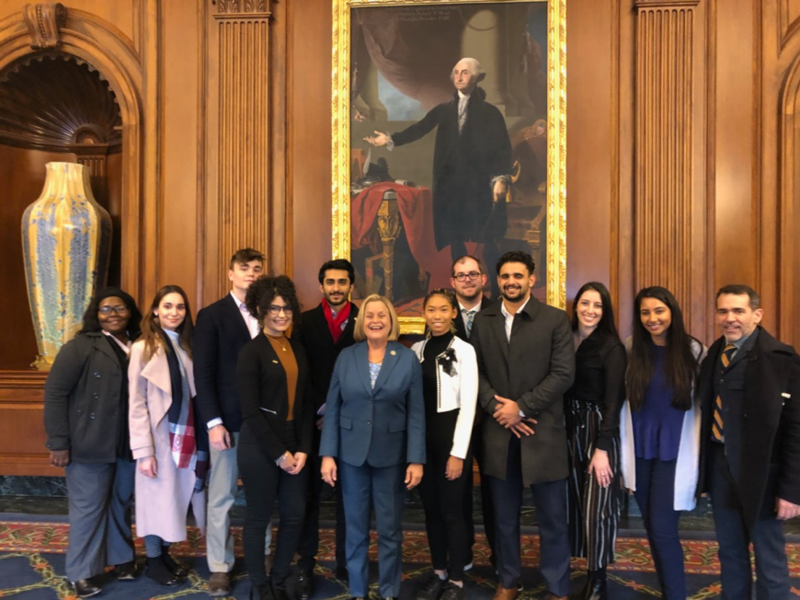 FIU students’ grasp and drive to solve issues facing the Western Hemisphere were on full display during the recent “Future of Latin America and the Caribbean” Washington, D.C. fly-in. The three-day enriched learning experience introduced a multi-disciplinary student leadership cohort to policy players and employers seeking talent from the public and private sector. The program has already led to internship or employment offers for FIU students. “The DC fly-in was an opportunity for me to connect with national thought leaders. I was able to build immediate and meaningful connections with professionals and policy makers. I couldn’t have done it without the fly-in and FIU’s office of Governmental Relations,” said Antonia Passalacqua, FIU senior who will be heading back to Washington in January 2019 for a paid internship with the Heritage Foundation, a public policy think-tank. Over the course of three intense days, students met with appointed and elected officials actively involved in the state of the Western Hemisphere, including representatives of the White House National Security Council, Eddy Acevedo, acting assistant administrator at the United States Agency for International Development; Eliot Pedrosa ’95, U.S. Alternate Executive Director to the Inter-American Development Bank; and Ambassador Anton Edmunds of St. Lucia. This semester’s fly-in was a partnership between the Talent Lab at FIU in Washington, D.C., Campus Life and the Kimberly Green Latin American and Caribbean Center (LACC). LACC was recently awarded more than $2 million for the continuation of the prestigious Title IV program and the Foreign Language and Areas Studies (FLAS) Fellowship. The Future of the Latin America Fly-In students with Congresswoman Ileana Ros-Lehtinen – at the historic Rayburn room, The United States Capitol. On Capitol Hill, students were able to engage with more than 10 congressional offices, including that of Congresswoman Ileana Ros-Lehtinen(FL-27) , a fellow Panther and the chair emeritus of the House Foreign Affairs committee; incoming House Foreign Affairs Chair Congressman Eliot Engel (NY-16); and Congresswoman Yvette Clarke (NY-09) . The experience included a visit to other entities also helping drive policy in the capital, such as the Center for Strategic and International Studies and representatives from multi-lateral banks and the corporate sector such as BMW. Pedrosa, who hosted the student cohort at the Inter-American Development Bank, discussed the economic development of the Western Hemisphere and how a high degree of informality causes a low degree of industry productivity. During the week’s hustle and bustle, the Jack D. Gordon Institute for Public Policy and the Kimberly Green Latin American and Caribbean Center released two reports and led a stakeholder discussion on the pertinent political, economic and security trends facing South America, Central America and the Caribbean. Keith Wuest and Emily Ervolino analyze obstacles affecting Latin America and the with LACC Director Frank Mora and FIU President Mark B. Rosenberg – at FIU in Washington, D.C. The fast-paced experienced concluded with a policy hack-a-thon competition between three student teams in which solutions for the region’s needs were presented to a panel of judges. 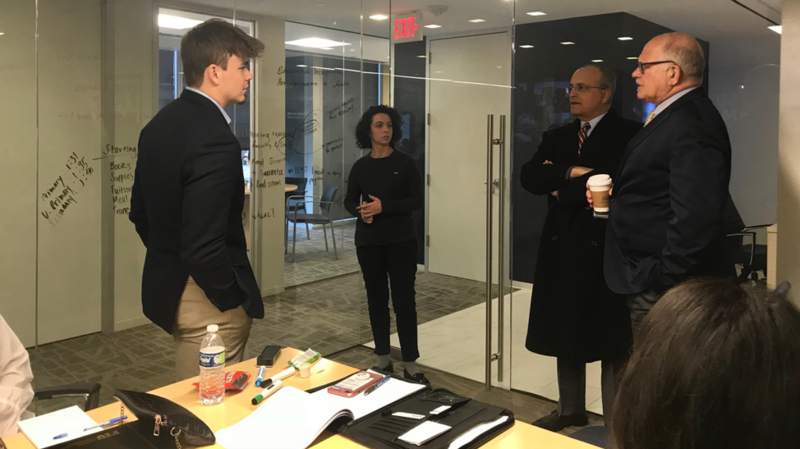 Even our own President Mark B. Rosenberg and LACC director Frank Mora, in town for a Latin America leadership dialogue were able to engage with students and offered expertise throughout the research gathering process of the competition. The teams presented solutions for the region’s needs and presented their findings to a panel of judges. “One take away from the program that I really appreciated is that my passion for foreign relations and my goals to go to the foreign service academy are really justified and supported by my university,” said Ryan Rodriguez, FIU Steven J. Green School of International and Public Affairs freshman whose three-experience included specifically curated connections with state department personnel and the director of the Thomas R. Pickering Foreign Affairs Fellowship in addition to the visits all students took part in. This Fly-In was made possible with the support of the Student Government Association and the Office of Campus Life. For more information on FIU in Washington, D.C.’s Talent Lab and student fly-in experiences, click here.